Coreen Kelly is a Licensed Professional Massage Therapist and a graduate of the Beijing Massage Hospital in China in the practice of traditional Chinese massage, a 2,000 year old massage practice called Tuina. Tuina massage is a deep medical massage along acupoint meridians. She also is a REIKI Master Teacher - a Japanese form of hands on healing and utilizes Swedish and deep massage as well. She has long been interested in the medical sciences and attended West Burlington College in Iowa, where she studied and tutored developmentally challenged college level students in Anatomy & Physiology, Medical Terminology, Psychology, etc. Her 16 year teaching background began at the corporate level where she was a corporate training instructor for Bell Telephone and later as a real estate training professional for a large firm in Washington state. Coreen became a professional massage therapist in 1995 when her failing eyesight began to rapidly diminish. She currently only has 5 degrees total peripheral vision and is legally blind, however, she feels that her low vision has actually been the impetus for her work and considers it a blessing in disguise. During her studies at the Beijing Massage Hospital in China, all of the therapeutic practitioners were blind. Research shows that when a non-sighted person touches with their hands, it is transmitted to the 'visual' portion of the brain instead of the 'touch' center as with sighted individuals, therefore literally making it possible for a low-visioned/non-sighted person to 'see with their hands'. This makes Coreen's work as a professional therapeutic massage therapist and instructor truly unique. Coreen is also the owner of The Brooks Therapy Center in Corvallis, Montana and treats human clients as well. Coreen has grown up with horses since her early childhood and has ridden and shown in Western Pleasure, Halter and Reining through the AQHA circuit on the West Coast. In the 80's after moving to Montana, she co-founded a nonprofit riding academy for the handicapped, teaching therapeutic horseback riding to handicapped children and adults. 'Good' horsemanship is her life study and passion. She is currently working on building a finished bridle horse in the traditional Vaquero style of horsemanship with her blue roan Foundation bred Quarter Horse filly, King's Nu Contessa. Coreen is a graduate from Equissage School of Equine Massage in Virginia which primarily utilizes a sports massage stroke style. 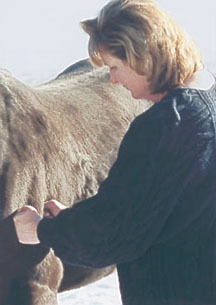 However, she feels that with the understanding and knowledge of the 2,000 year old traditional Chinese massage - Tuina, which are massage techniques being applied along acupoint meridians, stimulating & warming acupoints as well as muscle manipulation, that the human & equine experiences a total whole-body release unlike any other technique that she has experienced to date.